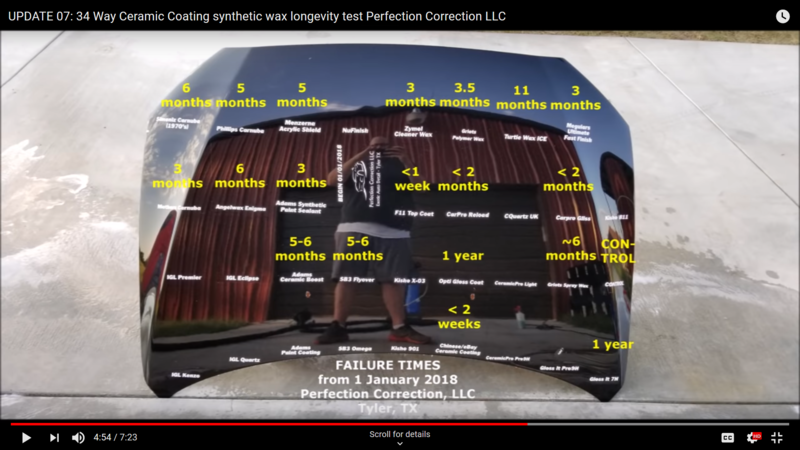 This guy has a fascinating comparison of how various coatings retain their hydrophobic qualities over time. The process is very simple. He tapes off various sections of a car hood, applies the coatings according to mfg directions, leaves that hood out in the weather, and checks them every month to see which ones fail first. This particular vid compares 34 coatings at the 1-year mark. Certainly a couple of surprises and one shock. Disclaimer: this is not my channel and I am in no way affiliated with the vlogger. Agreed. Some are polishes, some are waxes, some are coatings. This tests only how long the hydrophobic properties are retained. Nothing about quality of shine or scratch resistance. Although if water no longer beads, you can make some assumptions about other protective qualities. Near the end of the video at about 4:54 he gives a shot with all the names listed along with their failure times. I took this screenshot for my future reference. This video is the 8th of a series running tests over a year. He also has a series testing 20 different ones where he tested them for 2 years. Near the end of the video at about 4:54 he gives a shot with all the names showing and their failure times. I took this screenshot for future reference. I hope he features Hydrosilex﻿ in the future. Ya mean ya can't see that written on that hood?